This visible-light view of the sky highlights the bright M17 nebula, as well as the glowing hot gas filling the "bubble" to its left. 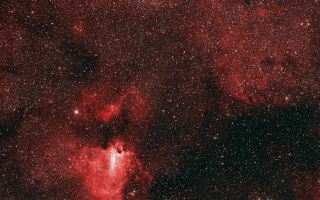 In this space wallpaper, a visible-light view of the sky highlights the bright M17 nebula, as well as the glowing hot gas filling the "bubble" to its left. While young, hot stars illuminate these regions, the large dark swath to the right hides an extensive region of star formation that can only be seen outside of the visible spectrum.